File Uploading is a very common in any web application. In this tutorial, we will introduce three different file upload operations: single file upload, multipe file upload, and ajax based file upload. We will create three JSP pages to allow single, multiple and ajax-based file uploads. Notice that these files except ajax based file contain form element with encytype=multipart/form-data, and <input type="file"> element. 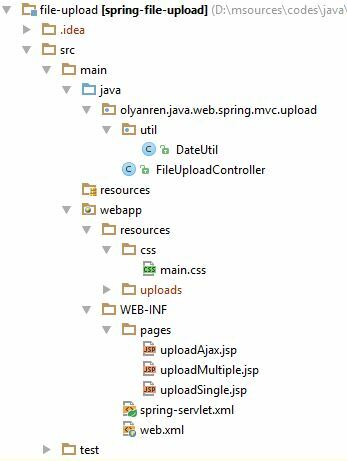 To handle files, we should give a name to the file input element, so these jsp pages contain <input type="file"> named as "file" and "file"
In Spring configuration, we register Apache Commons FileUpload for handling multipart requests. Notice that we configured multipartResolver bean by assigning CommonsMultipartResolver class. The id should be filterMultipartResolver if you are using Spring security, so when you change this id value, spring cannot upload files. Also note that we have configured maximum upload size limit by providing maxUploadSize property. This number specifies byte size.